Is The UK Taking Obesity More Seriously Than The USA? Whether you are 10 pounds over weight or 200+ pounds over weight, watch this video as it has value to all; especially those of us in the United States that have turned a blind eye on the obesity epidemic and how it is effecting our children. This video presents an accurate reality of what it is like to be morbidly obese in America, as well as how the medical professionals in the UK are using our obesity problem as example to help their obese population wake up and lose weight. Morbidly obese is 100+ pounds over ideal weight. People carry obesity differently depending on height and body shape, but the reality is that whether 30 pounds over weight is obese, 60 pounds over weight is extremely obese or 100 pounds or more is morbidly obese. 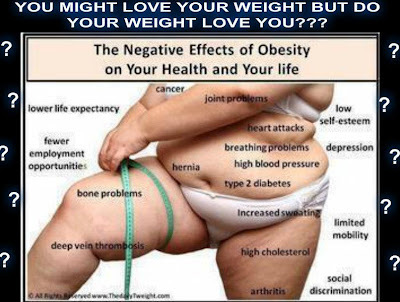 Any type of obesity can become mentally and physically damaging on people. Not just the obese individuals, but also their loved ones, friends and those who interact with them in life (such as bus drivers, morticians / funeral directors, nurses, doctors, etc). The video states that 1/3 of our population was "super sized" by February 2013 and estimated that 1/2 of America will be obese in just a few years. It is estimated that by 2020 1/3 of the UK will be obese. Keeping in mind that the UK is just a fraction of the size of the United States, these are all still staggering figures. Change is in order and it begins with us no matter what size or country. Did you know this? Where body fat is unattractive to some people, body fat is unhealthy for all people because fat stores toxins that can lead to life threatening disease(s). These are diseases that someone without body fat is less likely to experience. If you are over weight and are not experiencing problems now, does not mean that you should take for granted that you are not at risk in the near future. People develop liver cancer and disease without it being detected, so please keep this in mind. Regardless, some of these obesity stimulated life threatening diseases include heart disease, diabetes, high blood pressure, liver disease, pancreatitis, etc. No curvy girl initiative or benefits of obesity studies should persuade you into thinking that it is OK for your body. When you burn fat / lose fat, these toxins are released through your liver and urine. This is why we emphasize drinking the proper amount of water while taking Skinny Fiber and more towards 1/2 your weight in water if you can. This is what health professionals recommend for everyone (whether skinny or fat) to help keep your body properly hydrated and help clean out these toxins. The major point here is that body fat; especially belly fat smothers your organs and is specifically hard on your liver and pancreas. The liver processes what we eat and drink, aids in detoxification, blood clotting, protein creation and helps fight infections. Excess body fat is hard on the pancreas. The pancreas breaks down cholesterol, carbohydrates, creates proteins that aid in digestion; it secrets insulin that is used to break carbohydrates down into energy instead of fat. Both organs just cannot function efficiently with fat resulting from obesity therefore your metabolism and body cells are hit hardest. Heredity, lack of exercise, depression, processed foods, sugars and bad fats contribute to obesity and these health issues. How can you not want to burn fat, lose weight and make healthy life changes after knowing these facts? As it is said, "Rome was not built in a day" and your weight gain / fat increase did not happen over night. In many cases, this is a generational issue that could have been avoided. In other words, a few generations back in your family and their family, and according to how your ancestors ate and exercised in comparison to how you eat, work and exercise now. For example, "eat all of the food on your plate, there are children starving in China", children from larger families were encouraged to eat a few slices of bread with each meal, increased drinking of koolaid, pop, milk shakes and eating processed foods, more office jobs than manual labor, more fatty and processed foods than foods grown in a family garden or home made, etc. etc. etc. These eras of changes have not only created unhealthy lifestyles and fatter family members, but also those with health issues that are now considered hereditary. More about these evolutionary / generational changes are for a blog posts of their own, so I am not going to go into further analysis. The point is that we in the United States are more obese than anywhere else in the world and we need to pin point these types of patterns causing disintegration in order to make positive changes. Change is not easy though necessary for health and our existence. Of all of the movements to combat obesity, we have had little statistical proof of major change over the past few years, therefore I believe that focus on love should become a major contribution towards improvement because it is individual. Each person can take ownership of love that fosters local and global change. The first change that we must embrace is LOVE OF SELF and then others. This does not mean finding a lover, becoming cocky / developing conceit, or posting a hundred different pictures of yourself on Facebook, so that people can "like" and comment to show their love and acceptance of you, as well as your self-esteem identifying with these reactions. This does not mean changing your looks, wardrobe, friends, lover or reading a self-help book that makes you feel better for a day and not implementing what you have learned, though can include some of these over time. This is a personal thing that involves identifying the issues and addressing these problems (working towards changing them) with forgiveness, acceptance and how to make changes in order to better yourself and others. During this process, your self-esteem / your self-love is increased and your ability to love others is increased as well. Some find it hard to love people they do not know and to accept love from people especially strangers. They find this brotherly love superficial or overwhelming, though love has many facets that one should learn and understand as well. It is possible to receive and give love to strangers. If anything, one major way this is accomplished through your personal struggle and improvements, as well as simply caring enough about one another in brotherly love to address needs and changes. If you want to lose weight and become healthy ... If you want someone to lose weight and become healthy ... Love is where we start. Education and implementation is how we develop and combat obesity at this point in time. Those of us that are fat need to do this for ourselves and as example to our children, family, friends and strangers. 1) Start educating yourself on weight loss and healthy lifestyle changes. NOTE: Here is a blog post about 5 Foods To Give Up to start losing weight. 2) Start implementing what you are learning. 3) Accepting that no one is perfect. If you get off track, get right back on track. 4) Accepting your body height, shape and capabilities, and working with them. NOTE: This does not include excepting that you are overweight and fat folds; just that you may not look like you did as a child, teenager or young adult, as you are losing weight. Things may have changed in your appearance that are irrelevant to your losing and continuing to lose weight / get healthy again. You can work out while losing weight to improve certain things like your arms, abs, etc. Lines, loose skin, hip changes, etc. are what are irrelevant while getting back to your intended self. Those other details you may have to accept as changes or consult a doctor. 5) Set realistic goals and develop consistency. 6) Learn to love yourself and others - holistically. 7) Share progress, set backs, needs and strengths. If loving them more than you love yourself is what holds you together through change, then so be it, for now. Make the changes with them in mind, make the changes for them because of your love! This comes in form of acceptance and encouragement, as well as dietary, motivational, fitness and emotional changes. For example, research what bad / high fat / processed foods are and stop feeding them processed / fatty, sugar filled foods. It make take gradual change, though you will be a foot in the right direction for this and future generations. Additionally, exercise with them in ways that are fun for them. If this means that you do not get to use the elliptical at the gym a few days a week, but you are playing basketball, swimming, walking, etc., then so be it. Stop your spouse or friends from eating portions that are too large for them; especially children. Educate and encourage on the need for increased water in ones diet by serving them water instead of milk, juice or pop at meals. The list of small changes are so vast that there are books and websites about these healthy lifestyle changes. I posted a video above that I hope you took the few minutes to watch. This can happen to anyone that does not make sure it does not happen to them. That is not easy for almost 1/2 of our western society! Do we also have an issue with love? This is one of the ways that the United Kingdom is dealing with obesity before it becomes a major epidemic in their country in comparison to the obesity problem in the United States. Yet, it only briefly touches on why people become obese and remain obese. For example, the woman from the United States is married to a man that prefers fat women. The viewer is left to wonder if he is obese or with psychological reasons as to why he prefers his wife fat. The woman from the United States also mentions her addiction to food, though no one addresses why she is addicted to food (there are reasons why the body is physically addicted to food in western society), as well as why she did not love herself enough to combat both her husbands preference and her addiction to food. On the other hand, and in support of "loving others more than you love yourself to start change", as stated above, she does love her son and does not want him to suffer any longer behind her obesity (which has become a disability). She put herself out there for the world to see in order for change. The woman from the UK is motivated by her children and embarrassment. She does not want to get any larger and experience what the obese woman in the United States is sharing with her. She sees that as a quality of life that she does not prefer. Can you blame her? The UK representative and scope of the video shows what a toll obesity takes on the individual and the health care system. Although there is private healthcare in the United Kingdom, the majority of the population uses public healthcare that is funded by taxes. An increase in obesity in the UK can damage that social structure because of the additional expenses. Both people in the United States and United Kingdom are at risk for desensitization of the issue if obesity becomes an average condition (similar to how ADD/ADHD and other less familiar conditions are managed to date). This video makes me wonder when our government is going to value our health more than an industrial food system and the largest corporations? No level of "Get Up & Move" campaign is going to counteract that and this is why individuals need to love, educate and change themselves. I look forward to your feedback on this obesity video and blog post! What changes are you making? If you need help, let us know this in the comment section, too. If you are a private person or embarrassed, you can contact me directly through the ABOUT page on this site. I am not a health professional just a biology student that ended up going technical; a wife and mother that is working hard to make healthy life changes for myself, family and you! You can always join me by clicking the 90 Day Challenge link at the top of the page or following along to my blog posts until you are doing what you need to do for your health. Extending my love to you!